As we reported Saturday evening, a 1957 Ferrari Testa Rossa prototype sold for $14.9 million at the Gooding auction in Pebble Beach, Calif., tonight. Adding in the buyers' premium, the final price is $16.39 million, setting a record for the most expensive car ever sold publicly. Congrats to the new owners of a vehicle that's burned twice. Geely Automobile Holdings Co., whose parent owns Volvo Cars, fell to its lowest in almost two years in Hong Kong trading after saying demand for vehicles in China is showing signs of slowing. Geely dropped 6.1 percent to HK$2.15 at the 4 p.m. close, the lowest since Oct. 5, 2009, and extending this year's decline to 37%. The benchmark Hang Seng Index gained 0.5%. The automaker's shares dropped even after reporting first-half profit today that beat analysts' estimates. Inflation and economic policy tightening in the world's second-biggest economy pose "significant" threats, and demands for sedans in the country is "slackening", Geely said in a statement today. Fiat Chief Executive Officer Sergio Marchionne told Bloomberg today the automaker plans to change the terms of its joint venture with Tata Motors Ltd., without giving further details. We kind of hope Sergio told Tata before he told Bloomberg. 4th Gear: Will The Civic Kill Honda? Honda's reputation for world-class manufacturing may belie a slipping emphasis on design just as the automaker's North American factories are preparing to return to full production. Consumer Reports' decision this month to pan the Civic, a onetime favorite, shows Honda may need to focus as much on design as it does factory accolades and ramping up after Japan's March earthquake and tsunami, said Jim Hall, who runs automotive consulting firm 2953 Analytics Inc. in Birmingham, Michigan. Hall told Bloomberg that "Customers don't care about how the cars are made," Hall said. "They care how they drive and how they look. If you are doing an exceptional job building a mediocre product, that impresses the industry but not the buyer." 5th Gear: VW Pumps It Up! Volkswagen will unveil a one-seat experimental car with electric power train next month as Europe's biggest carmaker works to cut emissions and develop future driving concepts. The concept vehicle will be designed for limited journeys, VW spokeswoman Ruth Holling said today, confirming remarks by VW research chief Juergen Leohold to the Financial Times Deutschland. The model will be presented Sept. 8 in Berlin. Wolfsburg, Germany-based VW plans to bring electric versions of its Golf hatchback and the new Up! city car to market by 2013. The four-seat Up!, to be presented Sept. 12 at the Frankfurt auto show, may cost about 9,500 euros ($13,700), a person familiar with the product said last week, declining to be named because the price has not yet been officially announced. 6th Gear: The 2012 Mercedes-Benz SLK55 AMG Drops Its Top Here's the latest edition to the Mercedes-Benz SLK Roadster lineup — the 2012 SLK55 AMG. Under the hood of this new itty-bitty (by Mercedes-Benz standards anyway) droptop, AMG is employing a naturally-aspirated version of Mercedes-Benz's 5.5-liter V8. The new engine's throwing down 415 horsepower and 398 pound-feet of torque. We'll see the new convertible unveiled officially next month at the Frankfurt Motor Show. ⏎ That picture up top? 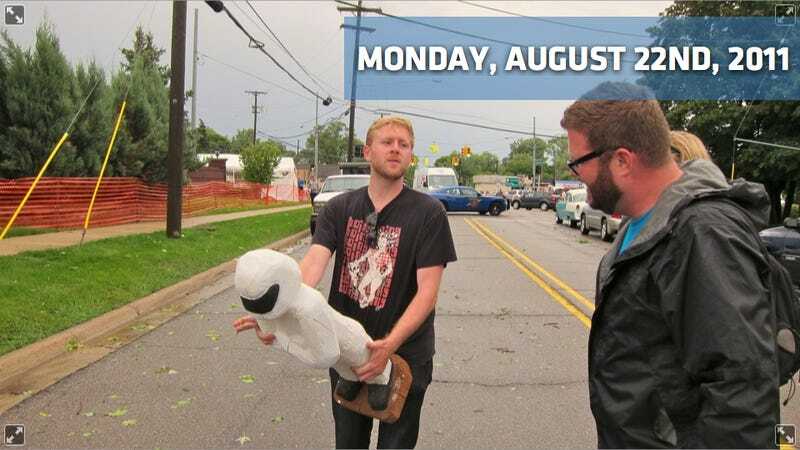 Yeah, that's Kotaku Commander-in-Chief Joel Johnson with a wooden effigy of The Stig explaining to Top Gear USA's Rutledge Wood what he'd do to the white-helmeted tame race driver if he were at the Woodward Dream Cruise. At least I think that's what he's doing.